The creamy white petals look splashed with crimson that seems like it is painted on. Painted effect gives the family name Rembrandt tulips. 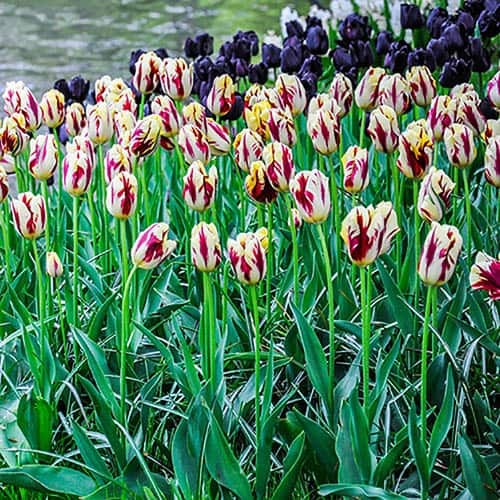 The creamy white petals look splashed with crimson that's been painted on - hence the family name Rembrandt tulips. As 'Grand Perfection' is a cross between single early-flowering tulips late varieties, it has the added benefit or a prolonged flowering period and it's incredibly weather resistant for such a delicate looking flower. It's long-lasting nature also makes it perfect for cutting and bringing indoors to make fabulous spring displays in vases and containers, on windowsills and mantelpieces. Mix up with a dark coloured variety like 'Queen of the Night' to really make them stand out in beds, borders or in the vase!